The role of the relation between culture and language seems to appear and disappear along the history of linguistic theories. The best known examples are probably the Humboldtian ideas on Weltanschauung and the so-called relativism of Sapir's and Whorf's theories, unjustly oversimplified during the predominance of universalistic ambitions within this pendular confrontation of epistemological approaches. From an empirical point of view, the evidences of any connection between both levels have been traditionally taken from the lexico-semantic level, since they are hard to find in the phonological or the morphological levels, whose typology is restricted to a small number of communicative and/or logical possibilities. Recent studies on figurative language, and especially on the phraseological level have revealed a rich field of possibilities for the study of the cognitive networks (associations of ideas) underlying metaphors and idioms, based on a cultural background, more or less typical of a national linguistic community. 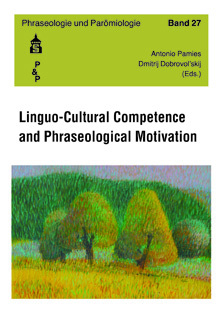 Merging with the Russian tradition of Lexical Semantics and Lingvo-kulturologija, modern studies on phraseology are dealing with the problem of metaphor in culturally bound idioms, as a way to throw a new light on the eternal debate concerning how culture and language are embedded into each other.